Perform your own magic show and learn the science principles behind the tricks with the 4M Science Magic Kit. Find the truth to your tricks as you perform a variety of magical illusions using common, everyday objects from around the house. From gravity to mathematics, you'll discover that magic is all about science. This set comes with instructions for performing over 12 tricks using the included props. Some common household items are required for the tricks (not included). Made using safe and high quality materials, this product is designed to last. Give the gift of science with toys and gadgets that foster curiosity and encourage scientific learning. Recommended for ages 8 and up. If you have any questions about this product by 4M, contact us by completing and submitting the form below. If you are looking for a specif part number, please include it with your message. 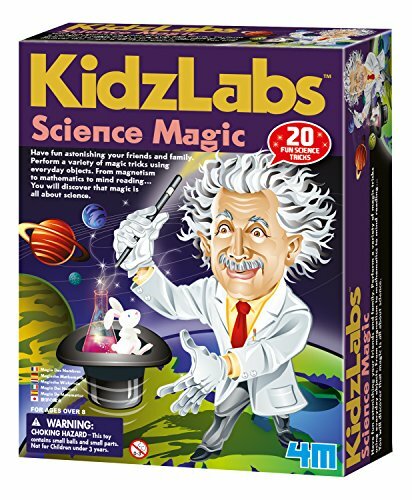 Marvellous Magicians Kit for Children to Perform More than 40 Magic Tricks. Compact and Portable.